A Volunteer is Taking Over My Flower Bed - JP loves LIFE! I was born and raised in the Volunteer State so I would like to think I know a little about volunteering. I’ve been blessed to have a lot of opportunities to volunteer with various organizations that cover various social services, the performing arts, and more. And I’d like to think I’d roll out a red carpet for some volunteer willing to work on my flower bed. There is a good bit of ivy I’d love to have disappear. There are a few plants that need a bit more tender loving care than I have offered too. But the volunteer that is taking over my flower bed was unexpected and never asked what I was interested in. See, the volunteer that has decided to do a number on my flowerbed is actually a volunteer plant, not a volunteer person. In gardening and botanical terminology, a volunteer is a plant that grows on its own, rather than being deliberately planted by a farmer or gardener. Volunteers often grow from seeds that float in on the wind, are dropped by birds, or are inadvertently mixed into compost. Unlike weeds, which are unwanted plants, a volunteer may be encouraged once it appears, being watered, fertilized, or otherwise cared for. Volunteers that grow from the seeds of specific cultivars do not reliably “come true,”[clarification needed] and often differ significantly from the parent. Such open pollinated plants, if they show desirable characteristics, may be selected to become new cultivars. via Volunteer (botany) – Wikipedia, the free encyclopedia. Since I’ve worked in agriculture so long, I have heard a lot about volunteers. I’ve seen them in fields (corn coming up through someone’s soybeans) and along the road (My friend Ray Prock even pointed out some volunteer cotton to make me feel more at home in his neck of the woods). I’m used to thinking of volunteers as total pains for farmers rather than the curiosity source I’ve let this become. Most volunteer plants in crops offer problems like taking water & nutrients from the planted crop, a hassle for equipment in the field and definitely an eye-sore. But this, I didn’t expect. A few months ago, as spring came to my new house, I took a bunch of pictures and asked friends to help identify the plants. At that time, I don’t think the volunteer had emerged. I saw it quite a while ago and figured it was something that had grown from a fall pumpkin or squash, but didn’t think much about it. Over the past couple of weeks, it has been growing like crazy! And my curiosity has gotten the best of me. I check on it every couple of days. It is really getting big….. with those leaves being enormous! Is this something I had on my porch last fall? If so, that is very interesting because I had mulched before the whole Halloween and Thanksgiving fun so I think seeds would have been sitting up on top of mulch. Did the folks who owned the house before me have something out there? Did a seed get dropped here by a bird or that bunny that shares my yard? If this plant grows so easily as to sprout from on top of the mulch in the shade without me watering it, I want to take it into my office for testing! (Please note, I’m joking. I can only imagine how people at my office would react!) Just the same, I’m thinking some vegetable farmers would love to have something so hearty growing in the field! And given my experimentation with a raised bed and growing some veggies, I have to wonder about its productivity since there the blooms seem to outnumber the tomato plants I’ve been spoiling! I’m betting its an ornamental squash, gourd or pumpkin and not something tasty though…. which may be just fine! Have you ever had volunteers take over a flower bed or garden? Yep – had some volunteer corn this year. Yours looks like some kind of squash for sure..maybe zucchini, maybe something else. 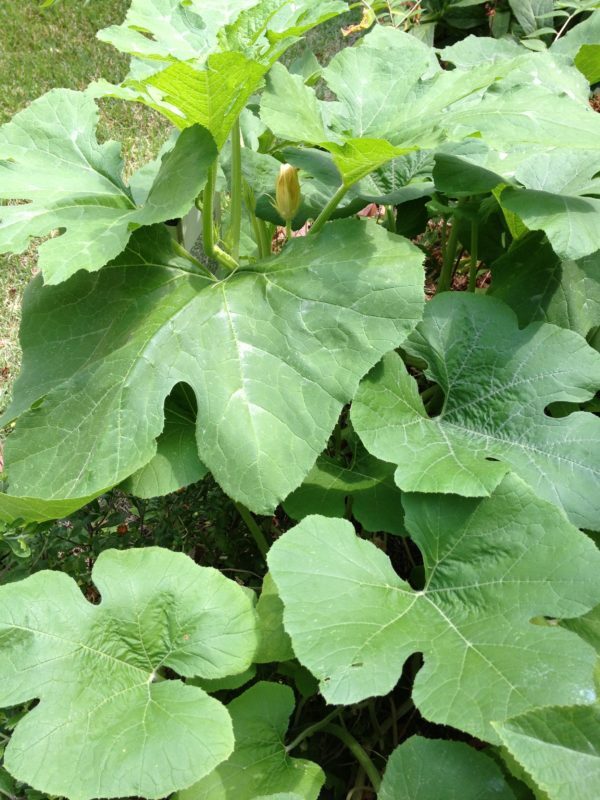 It’s *not* a birdhouse gourd (they have white flowers), if zucchini in a couple weeks there will be female flowers form down lower. 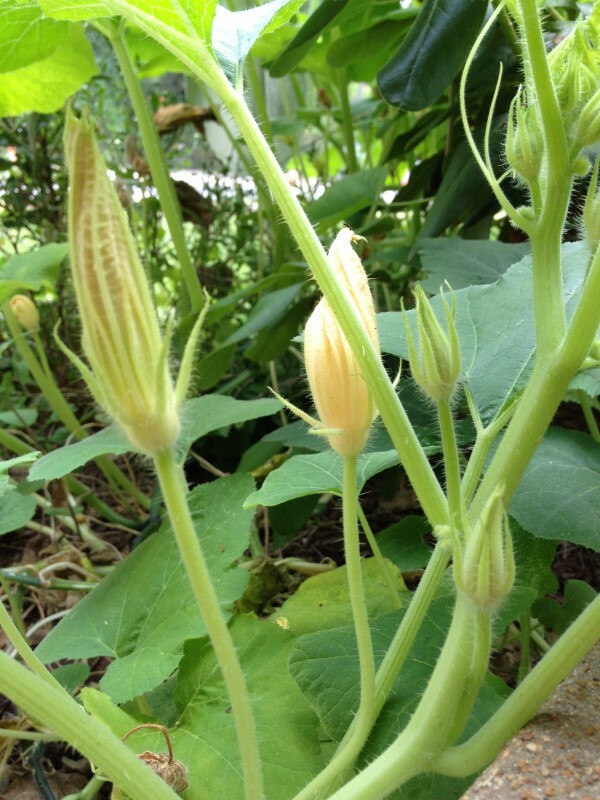 (yes they have male and female flowers) The females will have a small bulb – a ‘baby gourd’ or swelling at the base of the flower.. Thanks Jan! I’ll keep atching…. just know I keep my distance a little bit…. worried it may say “feed me Seymore” or something! It definitely looks like a pumpkin! Although it could be anything in the squash family. Hopefully, it’s a yummy zucchini. I had four volunteer tomato plants this year (and four last year… why do I even buy new ones?). I took two out because their location would have ruined something else. But the two that I left in are doing just fine and should be giving me red tomatoes any day now. My mother-in-law somehow manages to get Gerbera daisies (an annual!) to volunteer EVERY YEAR. I think she just has the perfect spot for them. I really hope it is yummy and if not, I hope its really cool looking! Afterall, it keeps trying to take my front steps! Interesting you have volunteer tomatoes! A lot of people have trouble producing tomatoes in the same spot each year. I’ve just started the Southern woman obligation of growing tomatoes…. I would love to find out I can fulfill it with volunteers! I need to know more about where your mom-in-law has her Gerbera daisies, I LOVE THOSE! In Mississippi, they are usually considered a perennial because winters are rarely hard enough. I had them all across the front of my house right in the midst of my hydrangeas.